Rate: $180 hr. plus chemicals for two men with a one hour minimum. Rate: $89 hr. with a $60 trip charge. Minimum of one hour. 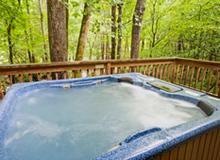 We offer an Annual Maintenance Service Agreement. Sign up and become one of our Preferred Customers to receive service within 48 business hours of contacting us. Call for an estimate for any of our following services. 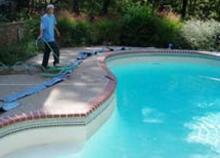 Vinyl liner replacements for in-ground pools. We take detailed measurement so as to provide a custom fit liner. This includes all shapes and sizes including custom shapes. No job is too small or too large. Repair, replace or new installation of equipment such as filters, pumps, motors, heaters, automatic cleaners and salt systems and more. Leak detection using state of the art listening equipment. Replacement or new installation of safety covers. Contact us early to reserve your opening or closing date.